(San Diego, CA) – We are releasing not one but two barrel-aged beers in January! The first release will be 2018 Barrel-Aged Speedway Stout, our Russian Imperial Stout with coffee that has been matured in premium bourbon barrels for an extended period of time to create the perfect blend of flavors. This barrel-aged release will feature notes of oak, vanilla, and bourbon to add another level of complexity to its already massive flavor profile. Designed to be enjoyed now or aged in the bottle for years to come, this special release is a truly unique beer that is as smooth as it is rare. Our second January release will be 2018 Barrel-Aged Belgian Quad! We aged our award-winning Belgian-style Quadrupel in a variety of freshly emptied red wine barrels from the California central coast to create a fusion between our California heritage and one of our favorite Old World Beer Styles. The result is a complex brew that showcases the rich malt character of a traditional Belgian-style Quad with a California twist. 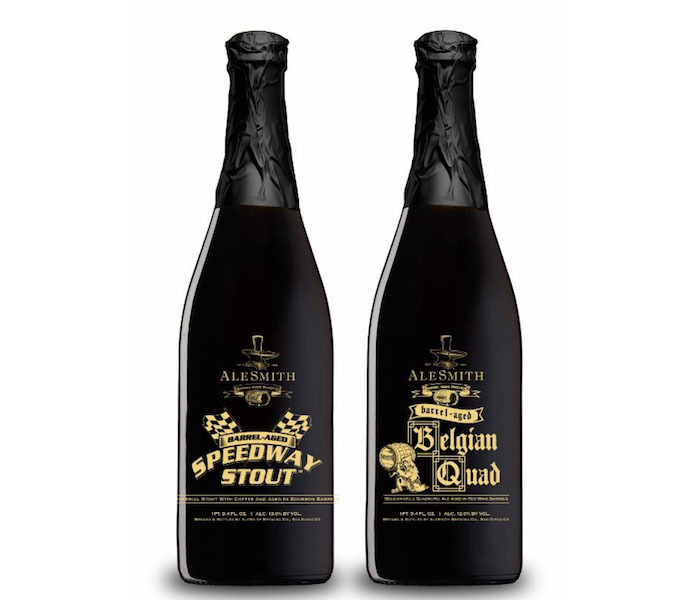 Both of these barrel-aged releases will be available for onsite purchase at the AleSmith tasting room gift shop on Saturday, January 27th while supplies last. Pre-sale for Order of the Anvil members will take place on Friday, January 19th, beginning at 11am through Sunday, January 21st at 5pm. A separate newsletter communication will be sent with information regarding pre-sale access. Public online sales will take place through Eventbrite on Monday, January 29th, beginning at 11am, after which bottles can be picked up beginning on Saturday, February 3 at our release party. There will be a four (4) bottle limit for 2018 Barrel-Aged Speedway Stout and a two (2) bottle limit for 2018 Barrel-Aged Belgian Quad.